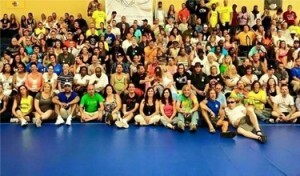 East Coast Convention of Narcotics Anonymous – The purpose of the East Coast Convention is to make accessible a convention that is cost effective for newcomers and to supply the Basic Text to jails and prisons. 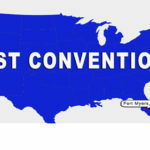 The purpose of the East Coast Convention is to make accessible a convention that is cost effective for newcomers and to supply the Basic Text to jails and prisons. Next stop, Fort Myers, Florida!!! Click Here for more info and to pre-register!! 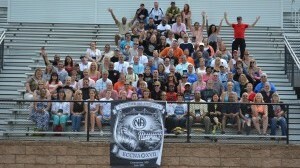 The East Coast Convention of Narcotics Anonymous (ECCNA) functions with the support of the Host Area, and the ECCNA, Inc. 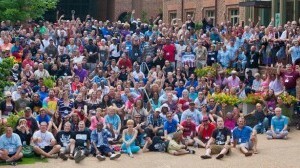 Advisory Board (AB) to coordinate and conduct a convention that will bring our fellowship together in a celebration of recovery. Any Area along the east coast of the US can bring a bid to the bid meeting at the convention and potentially host the annual convention. The Area which wins the bid is announced during the main meeting and immediately begins forming their Host Committee for the following year’s ECCNA. 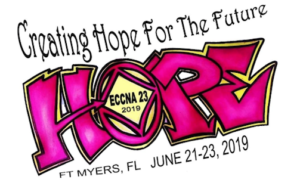 As written in our by-laws, the main objective of the ECCNA is to provide an annual East Coast Convention of Narcotics Anonymous (ECCNA) where addicts can meet and attend workshops to further their recovery. All proceeds from our conventions are used to further our primary purpose by supplying Basic Texts to jails and prisons. Historically the convention has been held at a school campus where housing and food is affordable so that the registration includes all costs including room and board. Between ECCNA 13 (1992) and ECCNA 14 (2010); the first ECCNA in this century, there was a long hiatus. Similar to the first ECCNA, the fourteenth ECCNA was attended by a small but very enthusiastic group. The attendees of ECCNA 14 fondly remember that event and because of their love for this convention, and our primary purpose, ECCNA was reborn. 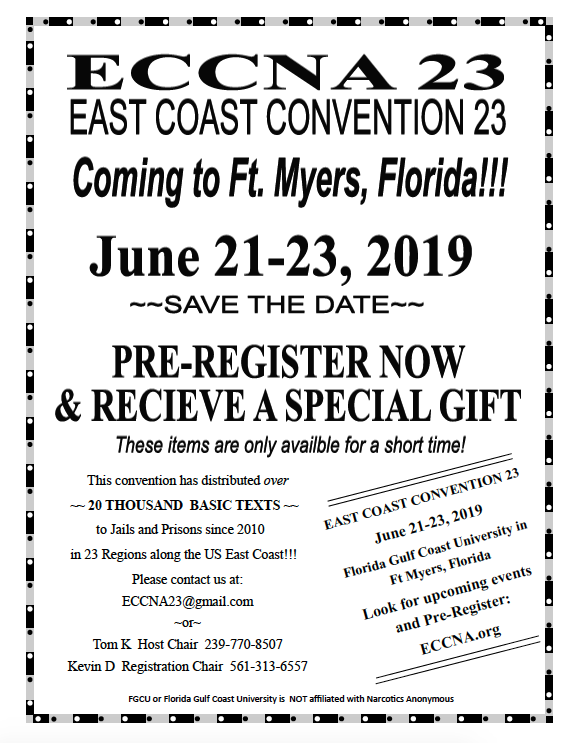 Thank you to all who helped make East Coast Convention of NA 22 – – June 22nd through 24th, 2018 a tremendous success!!! 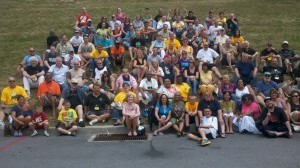 Please follow the links below to view the photos we have received from each of the conventions.